I had decided, in the mind-bending condition created by the heat, that it would be nice to spend a day at a mall. Yeah, a shopping centre with air-conditioning, shops all in enticing rows, sales signs flashing double digit percentages, cafes with overhanging legs of hams all seem to be a better idea than sitting in the back of a rented car shielding my body from the rays of the sun in the long car ride to Priorat, walking in the open air vineyard with little possibility of drinking much because I figured such a famous producer like Alvaros Palacios would not be pouring generous glasses for sampling. So I waved husband and Josh off early in the morning and went back to bed before getting up a bit later to visit the Internet cafe for 2 hours of lost-in-web fix. Followed by a stop at an unassuming coffee shop- laminated counter tops, yellowing walls, bored middle-aged owner reading sportsnews, no logos, no uniforms or indeed any branding in sight- for two types of churros with chocolate on Carrer Princesa; don't know the name of the place, when we returned in the evening the shutters were down so I couldn't even identify it. At L'Illa I shopped for a decent interval before giving in to lunch of iberico ham sandwich and a glass of cava at Andreu La Xarcuteria feeling rather satisfied with myself. Just then, my mobile rang; husband called to say he is in this fantastic restaurant. Good for you dear but my sandwich is great too! After lunch I shopped a bit more and then decided I had to eat fideua at Fishhh! again which I did, finishing my 'tea' just before 5 pm, again feeling smug because the fideua was yummy and this was to be the last savory meal before dinner at Espai Sucre later. Husband happened to call again, sounding even more excited than before and saying they're in a super wine shop and had a great time and are just about to start driving back to Barcelona. (Image from Josh's flickr set of the dinner). They finally made it back around 8 pm and we went for our Espai Sucre dinner at the fashionable hour of 9.30 pm. We tried their 3 dessert menus (Small for me, Chocolate for husband and Big for Josh). For an idea of their menu, click here. Most of the desserts featured were interesting, in terms of presentation, pairing of seemingly non-complementary ingredients, showcasing how far one can stretch the use of sugar to deliver different levels of sweetness, introducing other flavour and aroma dimensions like smokiness, finish etc etc but after tasting round the table a few times the cleverness of everything kind of washed over us. If this was our first port of call I probably would have been more impressed, and it probably was revolutional when it opened some four or five years ago but now the excitement seemed to have dimmed. The dishes were mostly very agreeable, some fared better than others e.g. my 'Ginger Ale' and toffee cream, as was everything in the chocolate menu which were faultless and I loved the olive cake that Josh got in his menu. The food was mostly good except for a really horrid red wine baba, but there was nothing that wowed. The other glaring factor was their wine pairing for all of their menu, which didn't really work either to enhance or match the food; perhaps they did not have the benefit of four sommeliers and sweet/ sticky wines are hard to play with therefore in spite of all the Tokajis, moscatos, sherries, madeiras etc all over the place most of the pours were disappointingly one-dimensional with short finishes with one particular wine tasting so sugary it came across more like prune juice than wine. What was more interesting was that during dinner husband kept mentioning bits and pieces about their day out in Priorat. "The smoked aubergines" at this restaurant called Irreductibles made a deep impression on him, he mentioned in not less than three times. Later on in the night, he refused to let me go to sleep until he finished recounting every wonderful detail of his trip. I begged him to stop, and instead to think about writing it all down so I can put it in this blog and so, voila, here is what he sent me two days after we returned from our holiday. I've only made minor editing changes. It's a bit long, so take the time to read it, and then visit Josh's flickr site for more pictures. 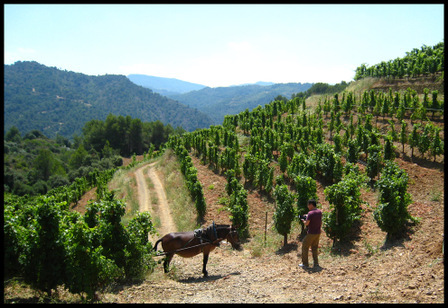 The resourceful chaxiubao has secured an appointment to visit the Alvaro Palacios vineyard in Priorat on 11 July at noon. “Dear, please drink moderately, drive carefully and have an enjoyable trip.” I gave Umami the assurance. In my mind, I thought, given the world renowned reputation of Alvaro Palacios, I don't expect much tasting. We set out at nine in the morning from the apartment to pick up our car at Hertz at the Barcelona Sants railway station. I wanted to be a bit in advance of our appointment to be sure we would find Alvaro Palacios without difficulty. The Hertz office is located just outside the railway station, a short 5 mins walk. Their cars are however parked at another location, in a multi-storey car park opposite the office, which is an additional 5-10 mins walk. BUT, before all that, I needed my morning coffee shot, and found the café next to Hertz perfectly agreeable. I ordered two cortado. “Anything else?” asked the counter tender, “No.” I replied. “It’s better not to have an empty stomach”, suggested Josh. Ok, I will have a croissant, seeing a tray in front of me. “Make it two. Hey, there are something else (pointing at the other corner of the counter). I will go check it out” he said. Josh would be unsatisfied to just have French croissant in the land of Catalonia! I thought. Not surprisingly he came back with a large, sweet looking pastry and finished everything. Not being able to find the exact street name in the navigator, I simply set the destination to Gratallops city centre, South-West of Barcelona, a roughly 140km- and 2hr- journey, and hoped to rely on the signage at the destination to guide us to Alvaro Palacios. We arrived at the destination, as indicated by the navigator, at about 11:30am. But, we found no sign post of Alvaro Palacios! It was a rather sleepy and rustic farmyard surrounding, with hardly any soul in sight. We looked around. There was a map post. “Let me check it out”, said Josh. Meanwhile, I had my pee break. “Hey, I have asked a passing truck driver. It’s (Alvaro Palacios) just there, pointing to a clay roasted modern looking light orange edifice on a small high ground, about 100m away. We must have missed it!” he said. We back-tracked and drove up to the open car park. There is a well-paved and broad step way leading up to the modern one-storey edifice. On the door step, we looked across and opposite, there is the charming little mediaeval Gratallops village, beckoning our visit. We pushed the darkly tinted glass door and immediately welcomed by an expansive modern open foyer, with beautiful wood parquet finish all round. There is a long white sofa and an ultra-modern orange arm chair sitting in the centre of the foyer. A large floor silver metallic astrological star, with the North prominently marked, lay in the middle of the foyer. Passing the foyer, further in, slightly to the centre left, was an open office, again in wood finish, including the ceiling height and wall book shelve. With the office entrance wide open, we could see a big bureau and a man, in white, working behind it. Slightly to the centre right of the foyer is a large bright glass-panel enclosed reception office, with about 3-5 workstations, leading further into another more obscured working area. There is a white spacious see-through meeting room on the immediate left of the main entrance. The meeting room looks out to the opposite medieval village. We saw wine glasses and empty decanters already neatly set on table. The building is well lit by the warm natural lights pouring in from the atrium. The whole place gives the feeling of harmony and tranquility. The young lady at the reception greeted us with a smile and asked if we were from Hong Kong, and they were expecting us and someone would attend to us shortly. Then, the man in white got up from his bureau and walked towards us. “Hey, the man himself!” whispered Josh softly. The man extended his arms to us and warmly shook our hands. He introduced himself “I’m Alvaro. Welcome and thank you for visiting us”. Alvaro is handsome, tanned and sporty, looking in his early forties. We thanked him for receiving us, introduced ourselves and the country we were from. He then told us the programme he had planned for us, which would start with a short visit to the vineyard, followed by a wine tasting. He apologized that the tasting would be slightly late and hoped that we would not mind. Of course not! We walked to his white well-beaten 4-wheel drive vehicle. Alvaro jumped into the driver seat. I took the front passenger seat and Josh took up position at the back, ready to shoot pictures. “I will show you first the younger vines which we use for Finca Dofi. Then, I will show you the 75 year old vines on the other side of the hill which are for l’Ermita”. We ride on the narrow, winding, steep, undulating and dusty hilly paths. Noticing our wariness he assured us, “Don’t worry, the car is solid”. I took at a peek at the steering wheel to check the mark of the vehicle, it’s the reliable Toyota! “Are you in the wine trade?” asked Alvaro. “No, we are wine enthusiasts!” I replied. We got off at the first stop, at a height of about 250m. Terraces of neatly lined vines appeared in front of us, what a splendid sight! We negotiated our way down the steep slopes. Walking in between rows of tidily and flatly tied vertical head trimmed vines. The vines are garnacha (or Grenache) and on average about 15 to 25 years old. This produces on average between 15,000 to 18,000 bottles of Finca Dofi each year. “All my vines are North-East facing. This is very important. All other facings will be too hot, with the crunching sun, and no good for the vines. The Mediterranean Sea is on the East, the Mountain is in the North. These are ideal conditions for vine growing, to fully benefit from the constant warm sea breeze, feeling and hugging the sea breeze himself with his arms, isn’t it nice?” said Alvaro passionately. “But, it should not be too humid or fungus will start to grow on the buddy green grapes” holding a bunch of it and pointing to an example. “We use and spray mainly sulfur on the vines, the leaves and grapes, to prevent fungus and other pests” he said. Alvaro saw some wild weeds lying in between the vines. He bent down without any hesitation to uproot them. “These have to be removed. I have 20 workers working and giving tender care to the vines. All manual works. Look at the vines, aren’t they beautiful? Look how green and glossy the leaves are. Look at the tiny luscious grapes budding, jade green. Very good! A lot of manual hard work has gone into it. No shortcuts” he exclaimed. “The vines have to be manually tied in this manner in order for the mules (we saw two, and two workers taking break under the shade. Alvaro waved and greeted them.) to pass through, to cultivate the soils and not to damage the vines. A lot of manual works” continued Alvaro. Along the way, Alvaro also flipped the leaves, inspecting them, and removing and throwing, casually, some bunches of grapes. “But, they looked perfectly good to me. Why did you do that?” I asked. “The vines need to compete. This way, the wines will automatically be richer with more depth. You know, a lot of knowledge and experience go into making good wine. No compromise” said Alvaro philosophically. I later learnt from Josh that Alvaro had studied wine making under the tutelage of some of the world great chai masters, including Petrus. Our next stop was l’Ermita vineyard, located on an altitude of about 500m. On the way, Alvaro pointed to us some plots of budded young vines, all no more than 1-ft tall. “I have planted them some 1 to 2 years ago with the seeds of the 75-year old l’Ermita vines. I’m lucky to be able to purchase some additional plots of land for this work. Look at them. Aren’t they growing beautifully. They will grow up fine and good, for future generations of Palacios wine makers!” said Alvaro contemplatively. “What’s the meaning of l’Ermita?” asked Josh. “It’s after the name of a chapel. There it is, pointing to the small chapel atop the hill. It’s right next to l’Ermita vineyard. You know, there’s a nun living in it” said Alvaro. “A nun, wow! Do you visit her? !” asked Josh. “Yes, sometime” said Alvaro. “I need to take pictures of the chapel.” Josh said. Alvaro: “Sure. We will go there afterwards”. “What’s your view of this year’s vintage?” I asked. “Don’t know yet. There were quite a bit of rains in May. It’s drier now. I hope it will stay this way. The next few months will be very important” said Alvaro. He saw a distant mule working on the soil. Pointing to it, “See, the soil is being worked on and loosened. This way, it helps the moisture in the soil from the rain water to evaporate, which is good for the vines” added Alvaro. Bending down and scooping up the soil with his palm to show to us, “Look at the soil, the schist. They are special and unique here. See how loose they are. They contain these slates” said Alvaro, bending down to pick up a piece of slate. “The slate stores the heat radiated by the sun, besides reflecting its light. Here, the slates are a bit greener and different from those at the Finca Dofi vineyards which are browner. This is because they contain more iron and therefore are naturally cooler. This gives rise to different characters to the wines. The soil is loose and drains water well. The water can be stored very deep in the soil, as deep as 10m. The roots of these 75-year old vines will grow to this depth and spread.” Also pointing to some large pieces of hard rocks, “the roots of the vines have to negotiate through these rocks. Can you imagine it? Well, all these conditions stress the vines. It is good for the vines and wine. This is what makes l’Ermita special” explained Alvaro. What an enological education, given by a wine master to us. “You know, l’Ermita vines and the grapes have reached the level of consistency that since 2006, there’s no longer any need to add anymore cabernet sauvignon, previously about 5%.It will be 100% garnacha” Alvaro told us. “How big is l’Ermita vineyard?” I asked. “2.5ha and gives about 6,000 bottles a year. Some years less, e.g. 2005” said Alvaro. I told Josh later that that's why 2005 vintage was priced higher than the earlier 2000 and 2001 vintages in a Barcelona wine shop. The visit lasted almost 1 hour. “We will go back now and taste some wines” said Alvaro. On the returned journey, Alvaro told us that he liked to write, about wine making. He’s currently working on a book on the history and different wine regions in Spain. He has published some articles in the press. However, he was humble and said that his writing was no good and needed a newspaper columnist classmate to help correct his writing. It’s this classmate who was bringing the group to come taste the wine. When we pulled into the car park, Alvaro saw his classmate standing on the steps waiting for him. “Here he is. They have arrived. Let me introduce you to him” exploded Alvaro with joy waving his arms to his friend. The group, about 12, consisted of senior citizens from the villages in Priorat. We shook hands and introduced ourselves. Before proceeding to the wine tasting, Alvaro asked one of his co-worker Juan to show us around his modern and state-of-the art wine making facilities, located in the same ‘chateau”, but underground. Juan explained the process, from de-stemming, crushing, pressing to fermentation. There are rows of large oak, French, we were told, and stainless steel wine tankers. The place is very clean. Juan pointed the wall embedded horizontally elongated cement wine tankers and told us that these would be increasingly preferred to the steel ones for their ability to better maintain constant temperature, better for high quality wine making. We also toured the wine cave, another ½ level lower ground, where hundreds of neatly stacked French oak barrels containing all three Alvaro Palacios’ labels, i.e. Les Terrasses, Finca Dolfi and l’Ermita, are aged. We heard Alvaro calling, in Spanish, at Juan from upstairs. He’s calling us to go join in the wine tasting in the meeting room. On the table, there were three filled decanters, labeled. There were also plates of Italian long biscotti to accompany the tasting. 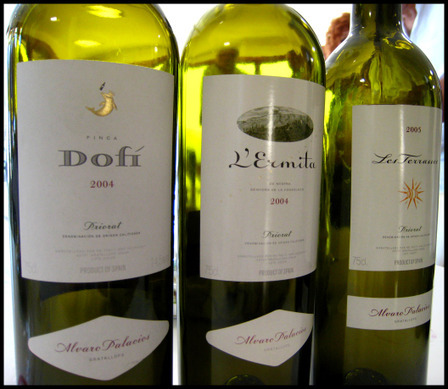 We would be tasting Les Terrasses, Finca Dofi and l’Ermita, all 2006 vintage, in this order. All wines are still in the oak barrels and will not be bottled until October 2008. A member of the group whispered to us that l’Ermita was the best wine label of Alvaro Palacios and very expensive, at 500Euros a bottle in the wine shop. We smiled. Alvaro went round pouring the wine. Then he spoke expressively, injected by frequent large arms gestures, in Spanish, about the wine we were about to taste. He later came to us to give us a brief description, in English, of the composition and expected aroma and taste of the wines. To me, all three wines had a deep, brilliant and clear purple colour. One lady suggested that she could smell cherries from Les Terrasses, another lady suggested plum from the Finca Dolfi. I thought I could smell chocolate from l’Ermita. “Ganbei!” one young Spanish lady smiled, raised and toasted her glass to us. We gladly returned the toast in Mandarin. We later learnt that she was the wife of the young newspaper columnist. She has spent 4 years working in Beijing and spoke fluent mandarin. All three wines tasted fresh which were unsurprising given their young age. They all had sweet flavour. To me, Les Terrasses had a slight tint of acidity and lightly tannic. Finca Dolfi was much rounder and with very agreeable tannin. As for l’Ermita, it was well balanced, delicious and long finish. Very satisfying! More pictures. “Can I take a picture of the magnum bottle of l’Ermita sitting on the top shelf in your office?” requested Josh. “Sure. Let me take you” said Alvaro sportingly. Meanwhile, Alvaro’s pretty wife has come to bid good-bye to all the guests. She’s waiting for Alvaro to go attend a wedding in Girona. “We’ve just visited Singapore early this year - the world gourmet summit. We also visited Bali. We have visited Sentosa. I like them” she told me. “Have you visited Phuket, Thailand?” I asked. “No. But, Alvaro has been there” she said. “This is the nature of my business. I travel a lot and she gets to travel with me” Alvaro has returned and injected.The visit ended at about 2pm. “Where do you plan to have lunch?” asked Alvaro. “In Tarragona, on our way back to Barcelona” Josh replied. “Oh, no. It’s too far and will be too late by the time you reach there. All will be closed. Nothing to eat! I recommend you a restaurant which is just opposite in the village across the road. Can you see the tree lining road, and the building with arches? There it is. The chef is a half Japanese and half brazilian. Try it. Very good” suggested Alvaro. “Is it japanese food? Emm… we would prefer non asian food” said Josh. “No, it’s Spanish, very Spanish, even Catalonian. It’s very good. You should try it. 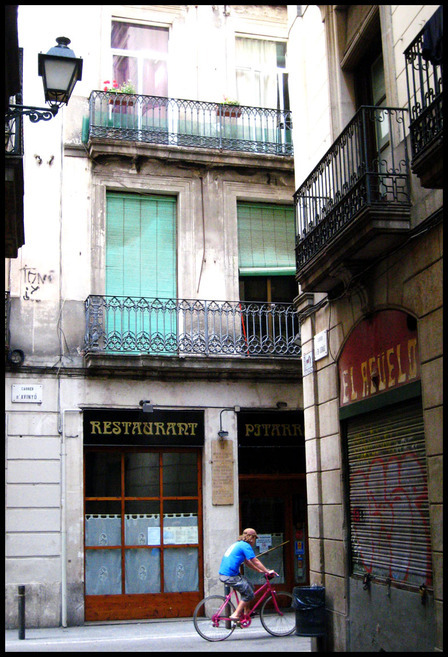 The restaurant is called Irreductibles” insisted Alvaro. “Irreductibles?! I have heard of it. It’s famous. Oh, it’s just here? Ok, we will go try it. Thanks for the recommendation” replied Josh excitedly. We drove up the narrow path. Josh said, “Hey, the restaurant is just on our left”. I almost missed it. The restaurant is just about 50m from the entrance of the narrow path. There’s a little open space just in front the restaurant, and we were lucky to have a lot directly under a tree to park our car. First impression - the restaurant name and logo are painted on the entrance wall, crookedly and somewhat faded manner. The restaurant reminded me of the lonely rustic buliding in the middle of some Mexican deserted town. It is painted in pastel pink, orange, green and blue. It’s sleepy. We were not sure if it’s open at all. Walking past the small open-air terrace and peeking in through the glass window panels to check. There seemed to be no one inside. I pushed the door. It opened. The restaurant is spacious, relaxed, and decorated with simple old rustic wood, metal furniture and wares. The dining tables are lined with white table cloth. Then appeared a young man dressed in t-shirt, smiling, visibly from the kitchen. “Do you still serve and can we have lunch?” I asked. “Yes. Please come in and where would you like to sit?” pointing to and suggesting a table in a bright corner near the large window panel. We chose instead to sit in a cooler corner further inward and surrounded by maroon painted walls and shoulder-height book case. “We have a menu. Is it ok with you?” asked the man. “Menu? Yes, it will be perfect with us” said Josh. The waiter disappeared into the kitchen and reappeared some time later. “We propose a three-course menu. The starter will be a sardine, the main course will be a beef tartare, and will end with desert. Is this ok with you?” Visibly looked unsatisfied, Josh asked “Do you have a degustation menu?” Looking perplexed, “Longer menu, more dishes?”. “No. Sorry” answered rather apologetically the young man. “OK, nevermind, we will go along with your proposal." said Josh. Ï requested an alternative to tartare and after checking with the kitchen he proposed a pork dish which I was happy to accept. Hmm, our expectation wasn’t very high or to be more precise no expectation to start off with. The young man came back with a carafe of water and asked if we cared to have wine and handed us the wine list. We settled by requesting the restaurant to propose wine pairing for the dishes. The young man was visibly pleased and eager to do so. Besides the 3-course meal, we were served two appetizers (a sorbet and a prawn cappracio with melon) and a few additional chef special deserts. The basket of freshly home made bread was replaced at EVERY course. There was fresh aromatic dense and flavourful olive oil to go with the bread. New wine glasses were served with every new pour. Josh's wine for the main course was even served from a decanter. He was impressed. Every dish was beautifully executed and presented. The ingredients were of tip-top freshness. The flavour and texture of each dish were well balanced and layered! One particularly memorable dish to me was my pork, which came in three well grilled sized pieces. The first look gave the impression that they were fillet mignon. Beneath the well grilled brown surface, was pink and moist fresh. It was one of, if not, the most flavourful, juicy and tender pork I have ever tasted. It was accompanied by de-skinned, mashed grilled eggplant, infused with very intense smoked flavour. Exquisite! As for the wine, there’s a particular one which striked us – a 2000 Mas Igneur FA112. This wine was proposed for my pork. To me, the aroma smelled like fermented black bean, Chinese soya sauce, which shocked me. The colour was a faint brown. For a 2000 vintage, still relatively young, it appeared unusual to me. I asked Josh for double opinion. I could see that he was reflecting hard. “Yu-loh or fish sauce” he defined. Was it corked? It must be the same question we asked in our heart. I asked Josh to have a first sip. “It tastes ok, actually quite good. Not spoilt” he claimed. I tried and confirmed it. To me, it tasted in fact very much like aged Cote du Rhone. Later, I checked with the young man. He was clearly very pleased that we had particularly noticed this wine. To him, it had the aroma of “animal!” He singled out that the wine was actually called FA112 – a tiny blue circle on the wine label. He told us that we could get the wine in a wine shop in Falset, a nearby town. When we told him that we had just visited Alvaro Palacios and it was he who recommended us to come eat here, the young man smiled and told us that Alvaro came eat here very often and pointed to an empty displayed Salon Champagne bottle and said “this is his favoured champagne.” “He makes very good wine, l’Ermita. But very expensive. You should try Clos Erasmus. Much cheaper. But also a very good wine. Parker has given it once 100 points. You know. Probably less than 100Euros” he suggested enthusiastically. We later did checked out the wine shop in Falset to look for the 2000 FA112. But they were sold out. We were not sure and did not get their 1999 FA112, which was priced at about 30Euros. Josh requested to meet and take pictures of the chef. The young man said that he’s busy preparing us a special desert and would bring it out to meet us. Finally, the chef, Ricardo Siginore, a thirty-something year old man with a pony tail appeared carrying a beautifully presented tray of desert assortment. Josh was busy taking photos of the deserts. 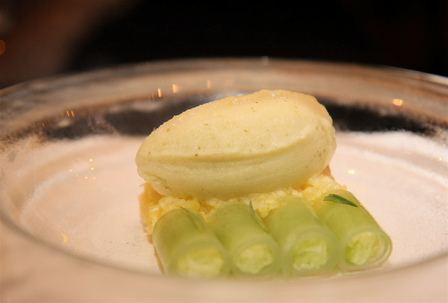 “You have to try this creamy desert quickly or it will topple in no time” the chef told us anxiously. One of them did topple. The chef then insisted to go back in the kitchen to do and bring us another one and he did. 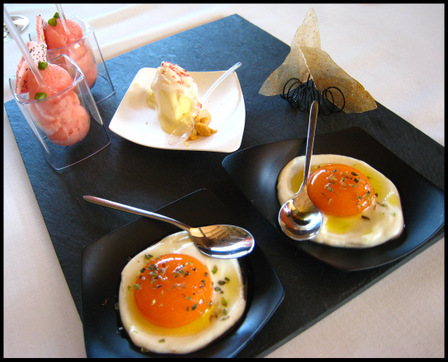 The desserts were very playful, especially a "fried egg" that was actually caramelised carrot and goat cheese! Later, he told us that he was from Sao Paulo and had been in Gratallops for 6 years now, and would be returning to Sao Paulo in a month’s time for good to do other new things there. (He has a blog La Vanguardia Gastronomica). At the end of the meal we asked the young waiter if there would be another replacement chef. He was not sure and said that it might not be the same as everyone came here just for the chef’s food! We left the restaurant at 5pm, after an extremely satisfying meal and wines, feeling very fortunate to have stopped by at Irreductibles. In our Barcelona itinerary, we have tried other much more reputable restaurants but Josh and I both sort of came to the same verdict that Irreductibles was probably the best and most memorable one. It’s a shame that Umami has missed this adventure.